This is the last of the tortoises, I promise. I finally got round to downloading some photos off my phone today, including one of this little chap – a tiny little baby tortoise. 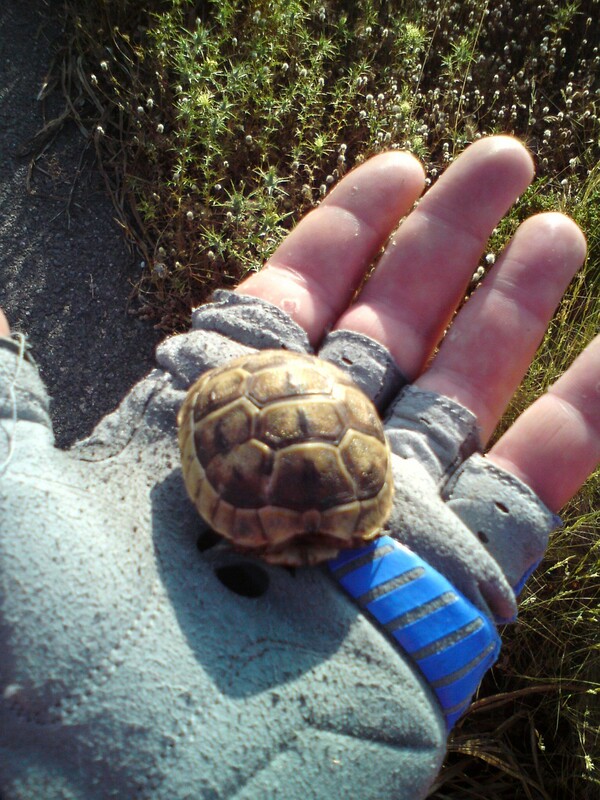 I came across him (or her – it’s very difficult to tell with tortoises) during a mountain bike ride. He’s being shy, but I promise that he had the full complement of head and legs. I’m no expert, but he can’t be more than a year or two old. It’s a good sign that the population of tortoises in Turkey is a healthy one. And yes, he is in the palm of my hand. I did pick it up. I know this goes against my earlier advice, but I did it because the little fella was making his way across the road when I found him. I think I was justified in moving him away from the traffic in the interests of safety.